Dubai, UAE; July 24, 2018: The future of retail is here: Dubai Holding and Emaar Properties have announced the launch of Dubai Square, a new retail metropolis that pushes the boundaries of modern retail and leisure in Dubai Creek Harbour by drawing on next-generation technology. Blurring the boundaries of online and in-mall shopping, integrating indoor and outdoor, and delivering a social experience like none other, the all-new Dubai Square is designed for the new era of customers, digital, connected and tech-savvy, and setting a benchmark for retail experiences in the 21st century. Dubai Square was revealed today at an exclusive retailers event that offered a fully-immersive experience for the participants. Through state-of-the-art 3D projection technologies, they were given an overview of the world of opportunities that await them in partnering with the bold and ambitious development that will transform the retail landscape. His Excellency Mohamed Alabbar, Chairman, Emaar Properties, said: “Dubai Square disrupts the traditional mall and retail experience. Focused on the aspirations of the new generation of customers, it reflects the vision of His Highness Sheikh Mohammed bin Rashid Al Maktoum, UAE Vice President and Prime Minister and Ruler of Dubai, to position Dubai as a global hub and a smart city. 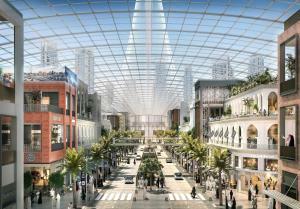 Dubai Square will play a pivotal role in further establishing Dubai as the next champion of global retail. Dubai Square is set in the heart of Dubai Creek Harbour, the 6 square kilometre mega-development only 10 minutes from the Dubai International Airport and the iconic Burj Khalifa by Emaar, as well as set by the historic Dubai Creek. Adjacent to Dubai Creek Tower, the astonishing new icon, Dubai Square – in its totality – represents a 2.6-million square metre (about 30 million square feet) retail, hospitality and residential district for the future. With Dubai being the fourth most visited destination in the world, Dubai Square will also be the closest mega-retail district to millions of visitors passing through Dubai International Airport, which is just 10 minutes away. In addition to serving the over 3 million population of Dubai, and over 13 million unique transit passengers to Dubai, it will also serve over 2.5 billion people who are only 4 hours flying time from Dubai. It will play a central role in driving retail sales in Dubai, expected to be over US$43.8 billion (AED 160 billion) by 2021, and serving the estimated 20 million tourists to the city by 2020. Following in the footsteps of Dubai’s postmodern evolution, Dubai Square will also feature an eclectic mixture of styles and references. The inspiration comes from leading cities across the world, with the fashion selection at the retail outlets drawn from London’s Oxford Street, Los Angeles’s Beverly Hills, Paris’s Champs-Élysées, Tokyo’s Ginza, Piazza della Republica in Florence and Madrid’s Plaza Mayor, to name a few. Dubai Square will be linked directly to the Dubai Creek Tower through a cutting-edge underground extension. Here, they can revel at a plaza at the base of the Tower. The Plaza is a clock-shaped haven of landscaping, palm trees and water features sprawling across half a kilometre of land – the length of ten Olympic sized swimming pools. 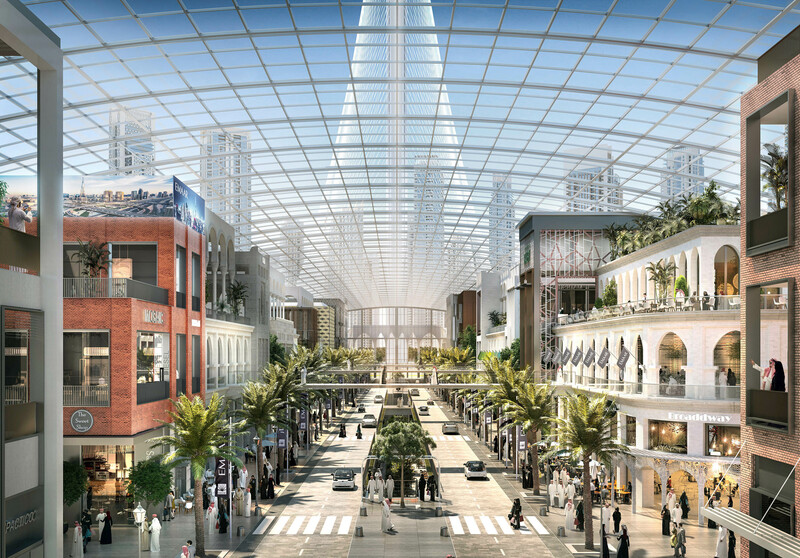 Dubai Square is designed with the modern consumer in mind. Offering experiences that go well beyond traditional shopping, it offers an assortment of spaces to socialise in an authentic city atmosphere, and raise the bar on ‘quality time’. Equivalent to the size of more than 100 football pitches – with over 750,000 square metres (8.07 million sq ft) of gross floor retail space – Dubai Square pushes the boundaries of design and mall layout. Dubai Square has nearly more than twice the gross leasable area of The Dubai Mall. Dubai Square is spread across three levels, each presenting a unique set of experiences to the customer. Skylights, glazed roofs and shopfront windows will be part of the sensory visitor experience. Parks, patches of green and lush landscaping will provide a natural balance to state-of-the-art facilities. Special LED technology is set to drive impactful and interactive backdrops and delight customers throughout their journey. Technological innovation permeates every aspect of Dubai Square’s function. Championing ‘omnichannel retailing’, it will offer customers a seamless blend of shopping via desktop, mobile or at a retail store. The physical and the digital at Dubai Square co-exist in harmony, with stores acting as showrooms for their online presences. Digital conveniences will include custom-designed mobile apps, quick checkout solutions, search and barcode scanning applications, radio-frequency identification technology, mobile payments and click-and-collect services. 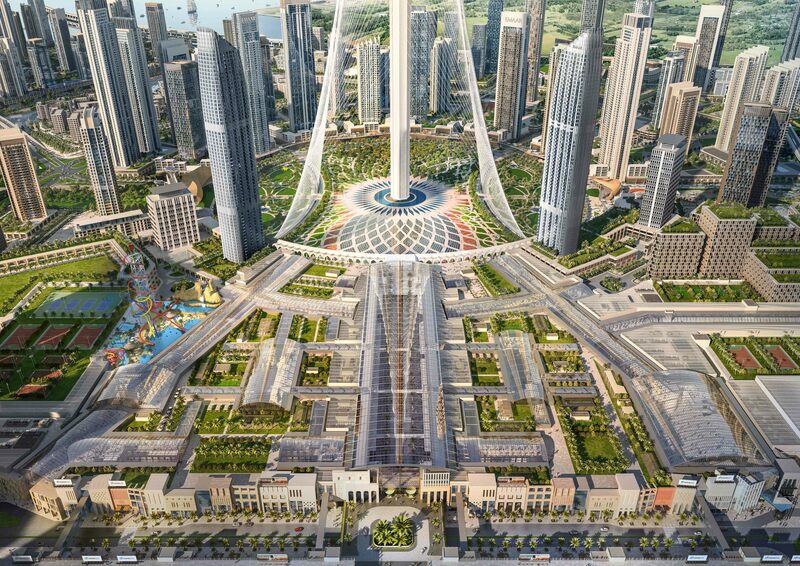 Dubai Square will also be a playground for tech brands around the world. It will also be home to innovators in the automotive, computing, sustainable technologies, 3D printing, drones, artificial intelligence and other emerging industries. Dubai Square will be home to the Middle East’s largest of its kind Chinatown, offering a wide range of retail attractions on the league of similar precincts globally. The Chinatown draws on the presence of over 200,000 Chinese nationals living in the UAE and the thousands of tourists arriving annually to the country. It builds on the strong Chinese investments in the UAE and the momentum gained by Chinese tourist arrivals with the introduction of visa on arrival by the country. In addition, Dubai Square’s ground floor features a groundbreaking events arena and a broad spectrum of event spaces on streets and alleys. The first floor has a magnificent four-lane boulevard lined with luxury retail, dining and leisure outlets. Unique immersive experiences will elevate the fashion offering at Dubai Square with special VIP dressing rooms, smart fitting rooms with interactive mirrors, curated private fashion collections, personalised AI recommendations, 3D printed clothing and accessories, fashion museums and more. Across the boulevard is a grand luxury avenue, with high-profile brands and a dazzling piazza, and scores of casual dining restaurants. The second floor is a family-friendly haven featuring an impressive array of activities at ‘Ice Adventure’, as well as a cutting-edge Cineplex, a waterpark, sports arena, supermarket and a metro link. Dubai Square’s entertainment repertoire will delight and astound each visitor. A futuristic entertainment arena with 3-D projection mapping, theatrical sound and lighting, high wire rigging and other cutting-edge attributes is at the heart of the offering. This world-class entertainment venue is set to host concerts and theatre shows, celebrity performances, acrobatics shows, museum-quality exhibitions and more in the way of fun for all ages. Visitors to Dubai Square can lose themselves in a choice of global gastronomy. Whether it’s nouvelle cuisine they crave, fusion, vegan, Peruvian, French-Vietnamese or a new dining concept, they will be impressed by the high-quality of service in cutting-edge facilities. Specially designed apps for ordering food and beverage on the premises will minimise queuing and long wait-times, while others are set to provide personalised dining recommendations and 3D-printed food delicacies. Dubai Square will also have live cooking stations, street vendors, festive pop-up markets, grab-and-go F&B offerings and an organic market, assuring consumers are spoilt for choice. Dubai Square also features an Art District, serving as a crossroads for artists and art lovers from around the world. From tall, Giacometti-style sculptures to small terracotta statues, from permanent exhibitions to ephemeral performance art, from large-scale concerts to one-man shows, the universal language of art will come to life here. In addition to serving as a creative hub for young designers, performers and other creatives, year-round immersive events will integrate retail with dance, drama, literature, painting, music, photography, cinema and other art forms. The Art District will be driven by Art Emaar, an initiative launched recently to bring new aesthetic experiences to Emaar’s master-planned developments and to engage people through various arts and culture initiatives, underpinned by the showcases of works by eminent artists such as Janet Echelman, Mark Quinn, and Emmanuel Moreaux, among others. A one-of-its-kind modern master-planned destination, Dubai Creek Harbour is located along the historic Dubai Creek in the heart of the city. It is only 10 minutes from the Dubai International Airport and the iconic Burj Khalifa by Emaar in Downtown Dubai, and next to the Ras Al Khor Wildlife Sanctuary, which is protected under the UNESCO Ramsar Convention, and is a biologically diverse wetland reserve home to migratory birds including pink flamingos and over 450 animal species as well as rich mangroves. Dubai Creek Harbour will brim with exceptional residential towers; a vibrant new precinct that ushers in the future of retail – Dubai Square; the spectacular Creek Marina with a modern yacht club; parks, green spaces and promenades; and world-class hotels. Schools, hospitals and recreational facilities in the vicinity, as well as Dubai’s upcoming iconic mosque, will round off the ideal family and tourist destination. It will feature four Dubai Metro links adding to the connectivity to the Dubai Creek District. With over 7.3 million sq m of residential space, nearly 940,000 sq m of retail precincts, 300,000 sq m of commercial space, over 66,000 sq m of cultural space, 700,000 sq m of parks and open spaces, and 24 hotels with 5,800 rooms, Dubai Creek Harbour will serve as a strong economic catalyst for Dubai. When completed, Dubai Creek Harbour will be home to over 200,000 people, and be a thriving economy that drives the tourism, retail and hospitality sectors of the city.